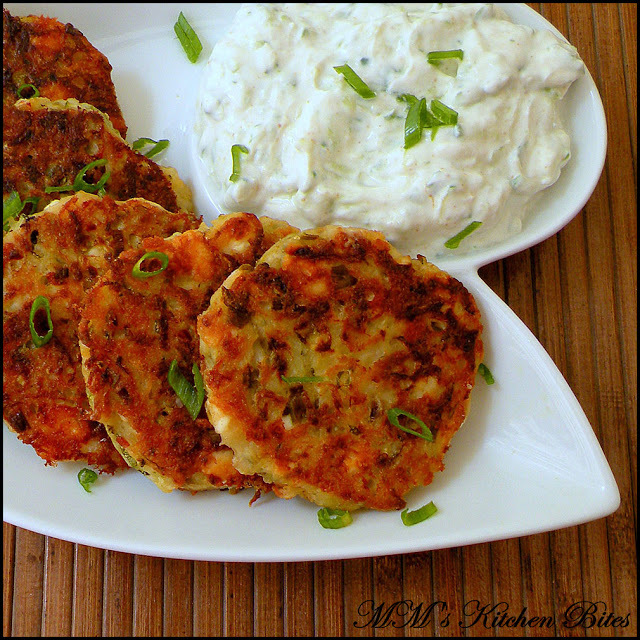 Home Breakfast Potato and Zucchini pancakes with Feta Cheese served with Tzatziki…Weekday Blues!! 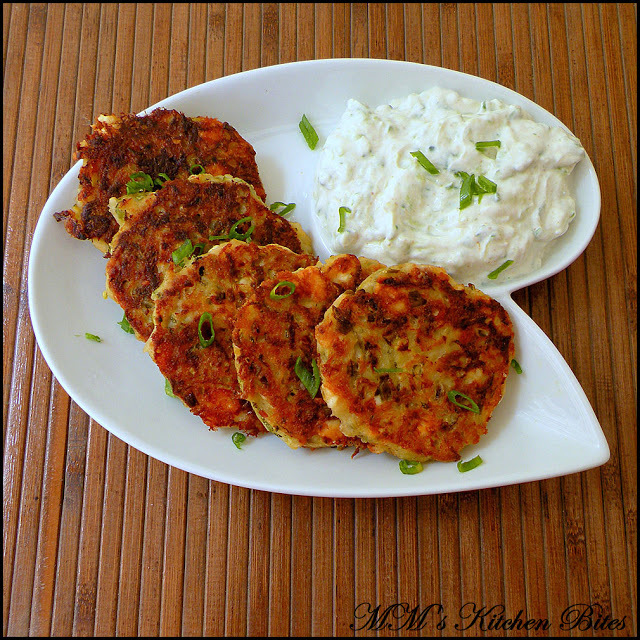 Potato and Zucchini pancakes with Feta Cheese…and let’s not forget Tzatziki…perfect for a weekend brunch or combine with a light salad for a perfect meal to chase away those weekday blues…yes, unlike normal people who just have to deal with Monday Blues, I, the drama queen, choose to extend them forever and call them Weekday Blues. We need to chill our Tzatziki so start on that first. Wash, dry and top and tail the cucumber. Using the large holes of a box grater, grate the cucumber. Squeeze out the water completely. 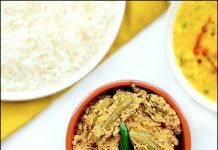 Mix the grated cucumber with rest of the ingredients in a bowl. Taste and adjust seasoning and keep in the refrigerator while you get on with the rest of the recipe. Wash, dry and finely chop the green onions. Add to a large mixing bowl. Crumble the feta cheese and add to the mixing bowl. If using mint or dill, chop up and add to the mixing bowl. Onion: (peel), grate, squeeze out the water/juice completely and add the pulp to the mixing bowl. Zucchini: (Wash, top and tail), grate, squeeze out the water/juice completely and add the pulp to the mixing bowl. Potatoes: (wash, peel), grate, squeeze out the water/juice completely and add the pulp to the mixing bowl. Add in lightly whisked egg, salt, pepper, chili flakes, sprinkle flour over the top and mix everything well together with a fork. Don’t overwork the batter. Heat 3-4 tbsp of oil in a large skillet over medium-high heat. The base of the entire skillet should be covered by about 1/8 inch of oil layer so adjust the oil quantity according to the skillet size you are using. Test the oil by adding a small spoon of the mix to the skillet – if the mix sizzles and bubbles immediately the oil is ready. Scoop heaping tablespoons of the mix into the skillet for each pancake and flatten lightly with a spatula. (I used a cookie cutter ring to shape this time). The thinner you make them the crisper they are – so about ½” thick if you want them crispy on the outside and gooey inside and ¼” thick if you want them really crispy. Fry until golden brown and cooked through about 3-4 minutes per side.Drain on paper towels. Preheat the oven to 220°C. Brush baking sheet liberally with oil. Place the baking sheet in the oven for 10 minutes. Scoop heaping tablespoons of the mix onto the baking sheet for each pancake and flatten with a spatula you would need to this quickly so that that the baking sheet remains hot. Bake until the pancakes are golden brown on the bottom, about 12-15 minutes. Flip the pancakes and bake until they are brown on the other side, about 8-10 minutes. Keep the peel on the cucumber and zucchini but leaving the peel on or off the potatoes is totally up to you. Keep the grating order as written – potatoes last or else don’t blame me if your batter changes colour to a dark dirty brown! Using dill or mint is optional but it gives a nice flavor dimension, so would suggest that you try using them at least once. I didn’t this time round as I couldn’t find dill and hubz hates mint. Needless to say if you do decide to add either one of them, add the same thing in the tzatziki as well. Go easy on the salt first as feta is salty – taste and adjust. And please don’t go easy on the pepper! If you don’t want to use Feta or don’t have it, you can either skip it or use crumbled or grated Paneer/Indian cottage cheese instead. Previous articleCreamy Roasted Red Pepper Pasta…shutting out the world!! Very nice take for the recipe… I will cook it soon.. I ate this at a restaurant where they kept the feta cheese and zucchini in separate layers and they baked it as a layered cake.. delicious dish..
By the way, I was searching for this dish and I found your blog… you have so many delicious recipes in here.. will bookmark it and for sure will try some recipes… Thanks for sharing your recipes.